CFO Publishing, leading publisher of news and information for senior finance professionals, today announced the release of their CFO Tablet Edition for the iPad, a new app built specifically for the tablet format that includes interactive graphics, engaging stories and interactive advertising opportunities. CFO Publishing has been providing senior finance executives with thought-provoking news and analysis for three decades through their flagship CFO magazine, CFO.com and the CFO digital edition. The new CFO Tablet Edition allows users to interact with our complete line-up of trusted editorial content like never before. Readers will get a first look at original content, not yet published in the magazine or online; provided through vivid graphics and multimedia, covering the most important and timely issues facing senior finance professionals. From within the CFO Tablet Edition, readers will also be able to easily access news articles from CFO.com via daily RSS feeds and the latest issue of CFO magazine. In addition to improving the reader experience, the new CFO Tablet Edition will also enable CFO Publishing to offer increased value to advertisers by expanding the potential engagement of ads. Ads will become interactive and provide brands the opportunity to more fully engage with their customers. For more information on advertising opportunities contact: Katie Brennan at 646-277-6476. 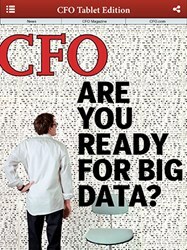 The new CFO Tablet Edition can be downloaded now from the iPad AppStore or iTunes by searching for ‘CFO’. Access to the content within the app is free to CFO subscribers. Login will be required and instructions can be found at http://www3.cfo.com/instructions. Non-CFO subscribers can purchase monthly issues or an annual subscription from within the app using their iTunes account. An Android version will be released early next year. CFO Publishing partnered with Mag+ to deliver the new CFO Tablet Edition. Mag+ is a company whose software platform helps content publishers create apps utilizing a plug-in for Adobe's InDesign desktop publishing software. The ONE Campaign, a global advocacy organization acting to end extreme poverty, and F#, the leader in music-powered digital ad experiences, today launched the agit8 digital experience, allowing people from around the world to listen and share protest music. The agit8 site accompanies the agit8 campaign, a music experience designed to create noise in the crucial week leading up to the G8 conference in Northern Ireland both online and in pop up performances happening in London. Visitors to one.org/protestsongs will find a diverse array of artists putting their own spin on classic protest songs. The site includes video performances from internationally-known artists to street buskers, and gives users the opportunity to add their voice to the fight against extreme poverty. Artists include Ed Sheeran, Mumford and Sons, Elvis Costello, Angelique Kidjo, Rokia Traore, Green Day and Macklemore & Ryan Lewis, among others. The microsite also combines user-generated content, curated playlists, lyric graphic creation, a photo gallery and a contest to vote for your favorite cover of a classic protest song. ONE.org collaborated with its members to create one of the worlds most comprehensive playlists of protest music. Comprised of songs in the categories of anti-apartheid, anti-war, civil rights, anti-poverty, womens rights and more, users can listen to the songs via Spotify. F# built the interactive playlist to educate as well as entertain, providing in-depth background information for each song. Users can easily discover the history of the track, its writers, artist, and lyrics. A video featuring live performances of the song and a collection of alternate performances complete the experience. In addition to the Protest Playlist, artists like Pharrell Williams, Tom Morello and others have lent their name to exclusive playlists highlighting causes close to their heart. Protest music finds its strength in powerful, memorable lyrics. ONE.orgs Lyric Graphic creator lets users choose their favorite lines from legendary protest songs and couple them with powerful images to create shareable works of art. The creators simple, intuitive interface, developed by F#, includes instant share capabilities that make it easy for users to raise their voices by sharing their artwork on Facebook, Twitter, and more. agit8 is all about using music to inspire action, bringing more people into the fight against extreme poverty, said Jeff Davidoff, ONEs Chief Marketing Officer. Given F#s expertise in music-based digital experiences we knew they could create this one-of-a-kind site with multiple interactive and music experiences, and they did not disappoint. We are proud to work with ONE and bring their vision online, and allow users around the world to listen, share and vote on their favorite protest songs, said Dan Merritts, CEO of F#. By integrating music right into the experience through playlists and video contests, were giving a new way for people to interact with music and spread the word to get others involved in helping to end extreme poverty. F# is the leader in digital music advertising, leveraging the power of music to create rewarding online experiences. Working with Fortune 500 brands and leading agencies, F# develops and implements ad campaigns across various music and social media platforms, including Spotify and Facebook. F# ads have appeared on tens of millions of devices in more than 15 countries. To learn more, please visit http://www.efsharp.com. ONE is a nonpartisan campaigning and advocacy organization of more than three million people taking action to end extreme poverty and preventable disease because the facts show extreme poverty has already been cut in half and can be virtually eliminated by 2030. Learn more at ONE.org. Enghouse Interactive, developer of the most comprehensive portfolio of interaction management solutions, announces the release of Communications Portal v9.0 (formerly Syntellect Communications Portal / Envox Communications Development Platform). A continuing evolution of the customer self-service experience, the latest release of this industry-leading IVR platform offers new features and improved performance and density, empowering organizations to create dynamic and flexible automated voice solutions that improve customer engagement and reduce the overall cost of delivering an exceptional customer experience. Multi-Engine Architecture: The ability to partition channels into multiple processes instead of a single engine, increasing the scalability, reliability and resiliency with a 2X increase in performance and density. Call Reconnect: Enables an automatic engine restart based on a pre-defined schedule or specific conditions with all telephone connections maintained and no lost calls. VoiceXML Studio: A graphical development environment that is used as an alternative to writing code is now a component of Communications Portal. Enhanced Console Security: Strength control meter displays the quality of the password entered and enforces new password strength requirements. Development Environment Enhancements and Updates: Enhanced support for CCXML 1.0, redundant ASR servers, resource pooling and dynamic ASR allocations, et al. Enghouse Interactive is committed to helping our users improve customer engagement while reducing the cost of those interactions. Communications Portal v9.0 provides a robust, standards-based voice and messaging application platform that enables more rapid development and deployment of dynamic self-service applications that help us deliver on that commitment, said J.R. Sloan, product director, Enghouse Interactive. To align our vast portfolio of offerings towards a common Enghouse Interactive brand, Communications Portal will be rebranded in the v9.0 release from its current nomenclature of Syntellect Communication Portal. Enghouse Interactive Communications Portal is an open, standards-based platform with integrated application development and management components that significantly reduce the time, cost and complexity of deploying voice and IP communications solutions. Beyond traditional IVR, Communications Portal combines the industrys most complete support for IP communication, including voice, video, SMS, and email messaging with comprehensive support for traditional voice communication. To learn more or schedule a Communications Portal demo, please visit http://www.enghouseinteractive.com. Enghouse Interactive delivers technology and expertise to maximize the value of every customer interaction. The Company develops the most comprehensive portfolio of interaction management solutions. Core technologies include contact center, attendant console, IVR and call recording solutions that support any telephony environment, on-premise or in the cloud. Enghouse Interactive has thousands of customers worldwide, supported by a global network of partners and more than 700 dedicated staff across the companys international operations. Enghouse Interactive is a subsidiary of Enghouse Systems Limited, a software and services company traded on the Toronto Stock Exchange (TSX) under the symbol "ESL." Founded in 1984, Enghouse Systems is a consistently profitable company, which has grown both organically and through the acquisition of well-regarded specialists including Arc, CosmoCom, Datapulse, Syntellect, Telrex, Trio and Zeacom. Learn more at http://www.enghouseinteractive.com. 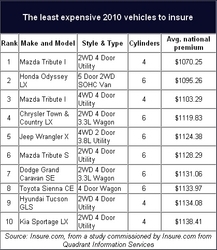 Insure.com's annual ranking of average car insurance rates reveals that the Porsche Carrera GT2 two-door coupe is the most expensive vehicle to insure among 2010 models. A 40-year-old male would pay a national average of $ 2,943.78 for car insurance annually and that's assuming the driver has a good driving record. On the other end of the scale is the Mazda Tribute I (2WD four-door SUV) the least expensive 2010 vehicle to insure among the more than 2,400 vehicles examined. Looking across other categories, the Dodge Caliber is the least expensive passenger car to insure, the GMC Canyon WT (2WD 2 Door 2.9L) is the least expensive pickup to insure, and the Honda Odyssey LX (5 Door 2WD SOHC) is the least expensive minivan to insure. Youll find average premiums for more than 2,400 vehicles, including national and state averages, in Insure.coms new interactive car insurance comparison tool. The profile of the average person who drives a particular model has great influence on the premiums for that vehicle. Costs for collision and comprehensive coverage are based on the model's "loss history." For example, small cars that are often driven by young, inexperienced drivers tend to be more expensive to insure. Car insurance rates also tend to rise with horsepower. Interactive Listening announced today the launch of an ingenious new approach to music education with the release of its Interactive Listening iBook, recently named by Apple as the #1 Editors Choice in all categories of textbooks. Interactive Listening is the brainchild of Pete Carney and Brian Felix, music educators and jazz musicians in Chicago, who were tired of the dead-end approach of using traditional textbooks to teach music. Instead they created a compelling iBook (interactive book) for iPads that remixes education with technology. At last, music history is fun! said Vandercook College of Music President Charles Menghini. Created for digital-savvy students, Interactive Listening features Hollywood-style graphics, interactive 3-D instruments and computer games. At the same time, the iBook includes interactive educational content spanning 35,000 years of music, with sounds from every continent, from prehistoric cavemen to Beethoven to Coldplay. Ive never seen anything like it. Jennifer Foxx, President of the Phoenix Music Teachers Association. In its early release in select markets in the United States, Interactive Listening is winning rave reviews. Its thorough, and beautifully conceived, said Barbara Freedman, author for Oxford Press. This book changes everything for education, not just music, said Mike Lawson, executive director of technology in music education in Nashville. This book is the next step in education. Thanks for paving a way forward, Jay Berckley, music director at the Village School and TED Conference Speaker. The Interactive Listening iBook was designed for schools that are replacing traditional textbooks with iPads. The self-published digital title is priced at $ 14.99, ten percent of the $ 149.99 textbook price Carney and Felix paid for a comparable textbook in college. The Interactive Listening iBook is available immediately on the Apple iBookstore for downloading at $ 14.99, and available in eight countries, including the United States, Canada and the United Kingdom. Music Educators Carney and Felix sought to create a more relevant, current experience for their students with Interactive Listening. We used the tactile experience of gaming and visual graphics from Hollywood movies to help music teachers in high school and college compete in the digital world, said Carney, Listening to classical, jazz or Tibetan music can be an entirely fun new experience if youre receiving instant quiz feedback about your listening skills. We discovered that students had a blast playing musical games, such as dragging and dropping parts of a symphony into the right order. Carney said students are more engaged and drawn into their new interactive way of conveying the drama, history and elements of music. Instead of reading about the great composer Beethoven, we created listening homework for the digital world, said Carney, We found that students want to discover music, express themselves and test themselves, not read boring biographical fillers and factoids. The Internet is full of information about when Beethoven was born, but that doesnt teach you how to understand his music. We believe our interactive approach instantly brings home the impact of music to our students in way old textbooks never could. The Miami VA Healthcare System is proud to partner with GetWellNetwork to be the first VA medical center in Florida to bring education, patient monitoring and entertainment tools to the bedside of Veterans receiving inpatient care in South Florida. Beginning June 25, inpatients at the Bruce W. Carter VA Medical Center in Miami have touchscreen access to television, movies, patient education and the Internet at more than 230 monitors installed in all inpatient rooms. 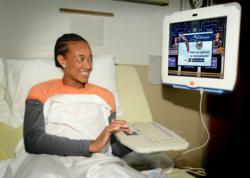 The network at the Miami VA also includes adaptive equipment allowing paralyzed patients interact with the system. We are proud to be the first VA in Florida to be using this system, said Paul Russo, director of the Miami VA Healthcare System. VA has always been very forward thinking in using technology to better serve our Veterans, but this system brings everything all into one place in a very easy to use way. The $ 2.4 million project will also connect to the patient monitoring system allowing for pain management, ordering meals, communication with medical staff and medical education sessions based upon each individual patients need. "As part of the VAs commitment to patient and family-centered care, Miami VA Healthcare System is transforming the way health care is delivered for Veterans in South Florida," said Michael O'Neil, founder and CEO of GetWellNetwork. "We are both excited and humbled to partner with the Miami VA Healthcare System in their efforts to advance patient-centered care for our Veterans and their families. Our work together will help Veterans engage actively in their health journey, along with their families and the staff who serve them." The Miami VA Healthcare System serves nearly 60,000 Veterans in South Florida, including more than 6,000 inpatients in fiscal year 2012. As part of the largest healthcare system in the United States, the Miami VA Healthcare System is a comprehensive healthcare provider that includes primary care, surgical care, and an entire suite of specialty services and mental health care for Veterans of all eras. For more information about enrolling for VA Healthcare, visit http://www.miami.va.gov. About this time last year, Vantage LED embarked on a journey to declare themselves as a major player in the led sign industry. Upon rebranding their logo and product line, they reached out to their loyal dealer partners with new options requesting feedback on what they needed to grow and strengthen their partnerships; a Rediscovery. This lead to creating a host of tools and resources, such as co-branded materials and an online resource blog, that supported a dealers identity as well as growth in their business; it give them Power. Now, Vantage LED, confident in their hardware, software, and people, launched an interactive website featuring a new product line called Series 51 and a university. Today, the led sign industry will have no choice but to take notice of Vantage LED; a Revelation. The industry has become content and stagnant; states Paul Martin, Director of Marketing at Vantage LED. Weve witnessed it and heard this over and over from our dealer partners. Were working hard and moving forward. Were having fun creating revolutionary solutions and always thinking Whats next? What makes our Dealer Partners lives easier, but more importantly, what makes an LED sign owner more excited about his display doing what its meant to do; grow his business! Vantage LED has definitely made the lives their Dealer Partners easy with the launch of their new product line called Series 51. Available on their full color and grayscale LED displays, this series offers a complete comprehensive 5yr parts and on-site service warranty, plus 1yr free programming through the revolutionary cloud-based service: SM Infinity. This is the best way to introduce LED signs to apprehensive market being overwhelmed by multiple oversea manufacturers. adds Martin. The owner can rest easy about the display's operation and get dynamic custom content for his business with the SM Infinity Content Creation Service. This cloud-based service also features an iPad app, automated diagnostic reporting, content requests via voice command, and the all new conditional smart scheduling, where the LED display will trigger messages upon certain conditions. If its cold outside, the display will feature jackets for sale. Too hot? It will feature cold drinks inside. Now, thats smart. Another amazing release with the new website launch is Vantage University. Exclusive to the Vantage LEDs dealer partners, Vantage University features Video Classes to help with Sales, Marketing, Project Management and Technical Support and a Resource Library full of Whitepapers, Self-Help Guides & Manuals, Strength and Project pieces. The industry is rife with advertorials and misinformation; states Deacon Wardlow, LED Technology Specialist at Vantage LED, It's gotten to the point where manufacturers are vendors and not partners; sources, not resources. Vantage LED believes in partnership and education and Vantage University is the resource PMs, sales, techs and the industry have been looking for. Vantage LED firmly believes it is their duty to educate and support their dealer partners in this industry keeping them a step ahead of their competition. Deacon continued, This is only the beginning of what Vantage University will bring to our dealer partners. They will really see what it means to take the lead with Digital Signage. Vantage LED is truly excited about this industry and what it has to offer their loyal and new dealer partners as well as future LED sign owners everywhere. They invite you to visit their new website and their facilities in beautiful Corona, CA. They promise never an ordinary experience. Market-leading content recognition service provider TV Interactive Systems is relaunching under the name Cognitive Networks. The new name is representative of a series of significant changes taking place at the technology provider. Michael Collette, a longtime veteran of the U.S. interactive TV business, has been named as the companys new Chief Executive Officer, tasked with leading the development and rollout of the company's products, raising capital, building out its staff and ramping up operations. Collette was previously CEO of PhyFlex Networks, a broadband access solutions provider, and CEO of Ucentric Systems, an embedded software company that pioneered multi-room DVR technology. He had previous stints at interactive TV middleware provider OpenTV and cloud-based interactive TV technology provider ICTV (now ActiveVideo Networks). Zeev Neumeier, Cognitive Networks Founder and President, said, Were very excited that Michael will be leading the company through this next significant growth phase. He brings a wealth of experience in the interactive business that will position the company to take a leading role in global innovation in interactive television." Cognitive Networks secured an initial round of $ 2.5 million in funding from Rogers Venture Partners. Cognitive Networks will be relocating from New York to San Francisco to tap into the talent pool and partnering opportunities in the Bay Area. Michael Lee, Managing Partner at Rogers Venture Partners, said, Cognitive Networks innovative technology has the potential to both change the way that consumers watch television and the ways that advertisers can connect with those viewers. Its rare to find a tech company making such great strides in the marketplace at such an early stage. Cognitive Networks partners with TV set manufacturers to enable content providers, advertisers, and others to provide greater engagement and interactivity to TV programming. 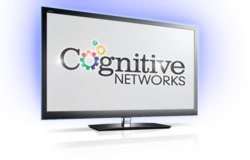 Cognitive Networks' ACR platform makes Smart TVs aware of the programming that they are displaying, enabling transactions, informational requests, or personalization of the viewing experience. More information can be found at http://www.cognitivenetworks.com.